Scotland has over sixty inhabited islands, and nearly fifty of them have scheduled ferry links. Most ferries carry cars and vans, and the vast majority can – and should – be booked as far in advance as possible. 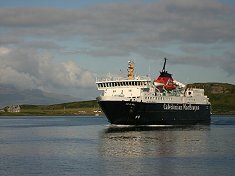 Hebridean and Clyde Ferries – The Caledonian MacBrayne Ferries, better known as CALMAC operate a regular service to the Western Isles. Shetlands and Orkney Islands Ferries – Northlink operates from both Aberdeen and John O’Groats to the Shetlands and Orkney Islands.